What Type of Spider Has a Zig Zag Web? Argiope Aurentia is the technical name of the yellow and black spider you might have spotted in your garden. This species lives in the U.S., Mexico, South Canada, Central America and sometimes Costa Rica. Also called the black and yellow garden spider, it is harmless to human beings and characterized by a zigzag vertical design in its web. The Argiope Aurentia has a black abdomen, with yellow or orange markings. Legs are black, with yellow or orange features. The spider's head has short, silvery hair. Although similar, the male spider is often brighter and smaller than the female. When mature the female can measure 1 to 1/8 inch. The Argiope can be found in a temperate, tropical or terrestrial habitat. You may spot it in a garden or field. Depending on the gender and climate, the Argiope Aurentia can live one year or more. Females can live for several years. 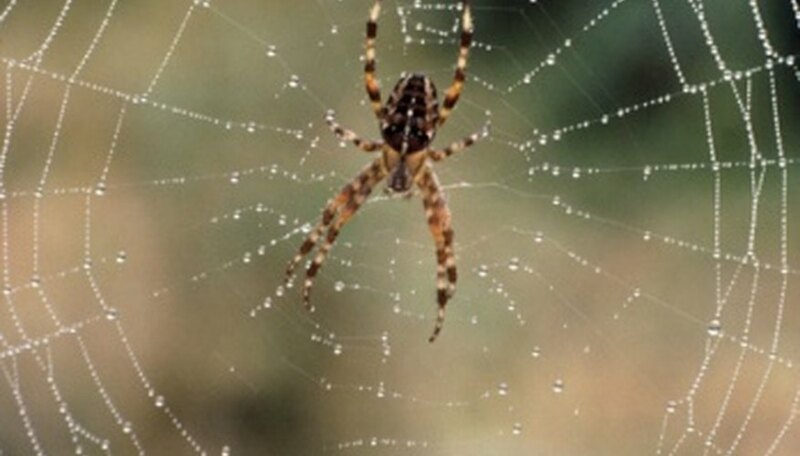 If they find a good habitat, they can be active night and day, attacking and eating insects trapped in their webs. The web is sticky and is moved by the spider when a prey is detected. When feeding, the spider also eat its own web. Once it has eaten the web, it rebuilds it during the night. Once it has found a suitable place for the web, the spider can stay there for rebuilding it. It takes a couple of hours to replace the eaten web. In the middle of the web is a vertical zizag design called stabilimentia. This help in capturing the prey, stabilize the spider and prevent birds to come across the web. The Argiope Aurentia hangs its head down from the middle of the web. When the male is mature enough, it goes looking for a female. Once found it, it stays at the edge of the female spider and sometimes builds another small web near there. After copulating, each female produces one or two brown sacs, containing 300 to 1,500 eggs. The sacs are hung in the middle of the spider web. Some female die during winter, so they can not assist when the spiders are born. It is unclear how many times the Argiope Aurentia mates in the course of its life. Ngalula Kabutakapua started writing in 2007 for the website Rockshock while working as a press officer for Ribes, writing articles for papers in Rome. She writes for "Fumo di China," "Guardian Cardiff" and "La voce degli Italiani." Kabutakapua holds a Bachelor of Arts in literature from University of Rome and a Master of Arts in international journalism from Cardiff University. What Kind of Spiders Are Poisonous in Arizona? What Causes Spiders to Appear in a House? What Birds Eat Millet Seed? What Pests Are Harmful to a Cotton Plant?